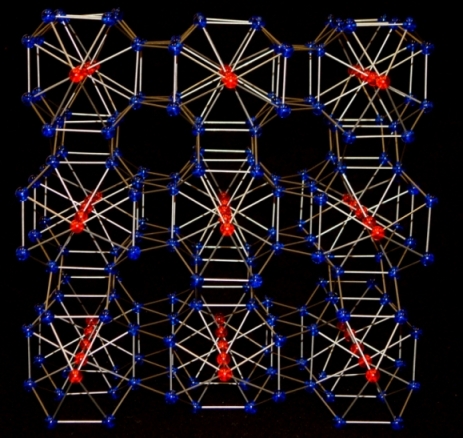 Our inorganic crystal structure models look stunning. Made from 7mm acrylic balls, drilled individually to give the exact bond angles, and held together with 1mm diameter bright polished stainless steel rods, they are precise and accurate representations of the structures behind so many modern, and not so modern, materials. Whether you want the models for teaching, for displays or to recognise a colleague's achievements with a presentation gift, our inorganic structure models are the best available models of their kind. Using bright, vibrant coloured acrylic balls, they make an eye-catching sculptures with a quality that reflects the effort that went into the synthesis of the real material. Our models differ from model kits from other suppliers in how accurately they correspond to the real structure. The folds in the Cu-O layers in YBa2Cu3O6-δ are clearly visible in our models, the many crystal structures of ice are readily distinguished and myriad other subtle structural features brought out in a way that is simply not possible with models made from standard kits. These models can be made to include extra features, such as highlighted unit cells, replaceable atoms - or we can simply make really large models.